At Eskom’s Matimba Power Station in the North West it is critical to use water optimally because of the shortage of water in that area. System integrator Autotronix recently completed a wireless, water balance telemetry system for Eskom at Matimba Power Station in Limpopo Province. The project included project management, engineering design, supply, software, instrumentation, installation and commissioning. 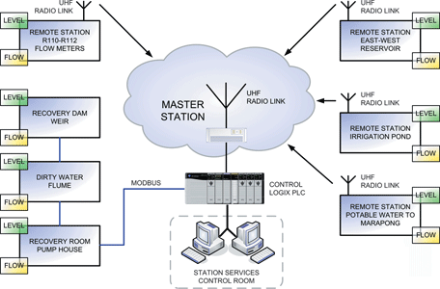 The system comprises five remote stations linked by radio to a master station, which is equipped with a Rockwell Control Logix PLC and ABB scada. Using Khrone model UFS 6000 clamp-on meters, the remote stations measure the flow of water coming into and going from the power station. One site had a large concrete pipe and Autotronix was commissioned to design a 5 metre concrete flume and have it manufactured and installed. An Endress+Hauser FMU 90 ultrasound meter installed in the flume is used to measure flow to a recovery dam. All data from the flowmeters is transmitted over a radio network using Motorola CM140 UHF radios and Pro-Design TS161 Data Telemetry units. A Modbus communication link from the PLC to the master station is used to read in the flow rates and the total flow. This information is displayed and recorded on the scada computer for further analysis. By using a systems integrator with knowledge of water treatment, scada, PLC, instrumentation and telemetry systems, Eskom Matimba was able to reduce costs through minimising project management overheads. The solution has already increased the functionality of the existing system and can easily grow to meet Eskom’s future requirements.